The 1976 hostage crisis and later rescue at Entebbe Airport in Uganda is a well-documented act of counter-terrorism that to this day is celebrated as a major victory for Israeli military forces, and to this date has had several dramatizations, including a couple of made-for-TV movies, and served as a major plot point in the Oscar-winning Idi Amin biopic The Last King of Scotland. Entebbe, or 7 Days in Entebbe as it’s known in the United States (we’ll refer to this film as the former, because that’s what it was released as here in the UK), is the first major theatrical English-language film to entirely focus on the scenario, and you can tell that the studios were so clearly confident in the film that its release was delayed numerous times, originally scheduled for a March release in the UK before being pushed back to April and then finally May, while essentially dumping it into US cinemas in March. That’s basically code for, “this movie is not very good,” and lo and behold it isn’t. In fairness, it isn’t outright terrible, and there’s nothing really wrong with the aesthetic, the acting, or even the ambition behind it, but its biggest misgiving is how it takes a real-life event that by and large wasn’t too eventful, and largely fails to find an interesting way to bring it to life on screen. If you’re not caught up on your history, the event saw Palestinian and German terrorists hijack an Air France plane, which had 248 passengers on board, many of them Israeli, and reroute it to Entebbe where they held the passengers and crew hostage until the Israeli government agrees to give them $5 million, in addition to the release of 53 Palestinian and pro-Palestine militants. On the hostage-terrorist side, it is told largely from the perspective of the two German hijackers, Wilfried Böse (Daniel Brühl) and Brigitte Kuhlmann (Rosamund Pike); meanwhile, we see Israeli Prime Minister Yitzhak Rabin (Lior Ashkenazi) and his Minister of Defence Shimon Peres (Eddie Marsan) trying to find a way to rescue the hostages which would lead to the eventual counter-terrorism operation that would later go down in history. The problem with trying to make this event a grand epic-scale thriller is that, in reality, the whole thing was largely uneventful. There’s not much friction between the hostages and the terrorists, as the vast majority of them are merely cooperative and outside of one or two instances rarely put up a fight (and even in those instances it’s resolved fast), and the scenes with the government figures are just scenes of suited men talking exposition back and forth to each other, in a very direct and matter-of-fact way that only politicians would do. For some reason, the film also tries interjecting a side-story between one of the Israeli soldiers (Ben Schnetzer) and his dancer girlfriend, but not only does that add absolutely nothing to the drama, but it also paves way for several sections of the film, including the climactic rescue operation, to be randomly interrupted by interpretive dance by the Batsheva Dance Company. Don’t get me wrong, it’s impressive choreography and they are fine dancers, but it’s like watching Zero Dark Thirty and all of a sudden there’s footage of the Bolshoi Ballet up on screen. It’s just odd, and you wonder why it’s there other than so the filmmakers can claim artistic integrity for their very ambitious take on a largely uneventful piece of history. Overall, though, none of it translates to something that’s particularly cinematic, because director José Padilha can’t seem to find much that’s of interest in Gregory Burke’s screenplay, and instead just plays it out like an extended episode of an anthology series centred on counter-terrorist operations. There’s no reason that’s given for us to care about what happens, because it’s akin to listening to a history teacher just standing there and giving students the mere facts instead of really engaging them in the actual events as they unfold; you’re largely bored and unengaged with any of the characters or things happening around them, except for Idi Amin (played here by Nonso Anozie) who briefly pops up here and there, which brings relief only because you know who Idi Amin is, as opposed to the other people we’re meant to be focusing on who we don’t know as well. As far as the acting goes, it’s good but it’s nothing that can bring to life anything that goes on in this script. Pike and Brühl are probably the most compelling actors in the film, but even though we do get plenty of scenes with them we barely get to know any of them outside of flashback scenes which only raise further questions, such as how and why they got involved in the Palestinians’ struggle to begin with, but luckily they are good enough actors to sell the rare few scenes where they can actually give hints of the people they’re meant to be portraying. The rest of the ensemble for the most part are just side-lined, showing up now and then but adding little to nothing major to the overall drama that the film is clearly going for. It may have been a pretty exhilarating event in reality, but on film – or at least, how it is portrayed in Entebbe – it’s just not entertaining or interesting enough to really give much thought over. 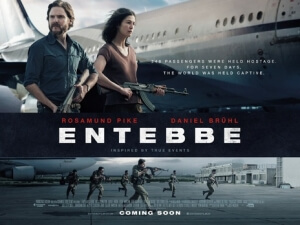 Entebbe is ambitious and well-acted, but overall it comes up short with trying to find a dramatic hook to tell an uneventful real-life story on the big screen, and the result is a dull and largely unengaging slog of a movie.